Soak the boiled rice on the previous day afternoon for 4 hours. Wash and drain the water. Wet grind the boiled rice. Meanwhile cut the Ash gourd into small pieces. Grind it using the mixer grinder jar first. Then add this in the wet grinder so that it becomes a fine batter. Store this batter in a separate bowl and cover it with a lid. Do not add salt. Then dry roast the raw rice for few minutes (need not to sputter). Make coarse powder using mixer grinder jar when it is cool. This should be stored in a separate air tight container. On the next day morning, mix the raw rice powder with batter. Two hours later, add sprouted groundnuts, grated carrot, chopped cabbage and salt and mix thoroughly. Instead of boiled rice, use millets to make idli with the same procedure. Instead of Cabbage & Carrot, use Chayote (ChoCho) or Indian beans (Broad beans) or any two types of vegetables of your choice. 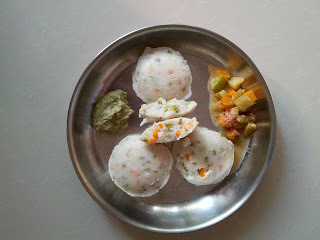 You can also find Satvik Idli made with Ladies finger and Sorghum here.